It’s a new year, new start for parents working for American Express after the stalwart of the financial industry has vowed to extend parental leave to twenty weeks of full pay for new parents, regardless of gender. In addition, they are also allowing their female employees to request another 6-8 weeks if they need medical leave after giving birth, regardless of whether they are contracted to full time or part time hours. This huge increase comes into play for all workers employed by the company for one year or more. A great change from staff’s current allowance of six weeks fully-paid absence for the main parent, lowering to just two weeks for secondary carers. Also, a part of their rejuvenation of the parental leave system is a service which allows parents to access a lactation consultant, 24/7 to promote healthy breastfeeding. If traveling for business, a lactating mother working for the firm is also able to package their own breast milk and ship it free of charge under new rules. The firm has also taken great lengths to ensure that those who have a family through less conventional methods are also well protected. They have pledged $35,000 per child to employees who are attempting to adopt or extend their family through surrogacy up to a maximum of two children. And those who are undertaking the stresses and financial strains of infertility treatments will also receive the same sum to help counteract costs. 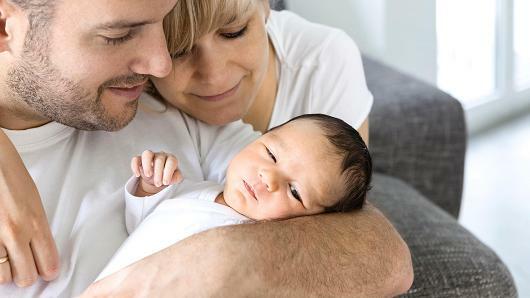 The company’s decision to offer more generous parental leave terms has come hot on the heels of other major companies choices to overhaul their leave policies. Ikea, for example, has decided to offer their U.S. workers 6-8 weeks of paid parental leave whether they are contracted or hourly workers. Those on leave can also add between 6-8 weeks on top of this, paid at a half-rate. Etsy is currently leading the way when it comes to their family leave policies, allowing their staff to take 26 weeks of fully paid leave, regardless of the staff member’s gender. This is in line with some of the maternity policies seen throughout Europe and the UK, where 26 weeks is considered the norm. Unlike most plans, this leave can be taken any time during year one and two of the child’s life. But back to the financial sector, we have to look no further than investment company AXA to see where improvements in family leave are soon to happen. They have recently pledged that both their part-time and full-time workers with a year or more service for the company can take a maximum of sixteen weeks off, fully paid if they’re the main child’s carer. This is a rise of six weeks from their current standard of ten weeks leave. Those who are not the main carer can take four weeks paid leave to bond with their child. Uniquely, AXA has launched what they call their ‘infant transition program’ which gives new parents a maximum of 30 days subsidized care during the first year of their child’s life, with three of these days being completely free of charge. It seems that while change has been slow-coming for parental leave when comparing it to other countries worldwide, there is some movement at last in how these outdated guidelines are being addressed. Even so, it will no doubt take many years before a more generous standard is offered wherever you choose to work.